Tampa Bay went right up to the May 1 deadline to select the final prospects for completion of February's three-way trade with the D-backs and Yankees. 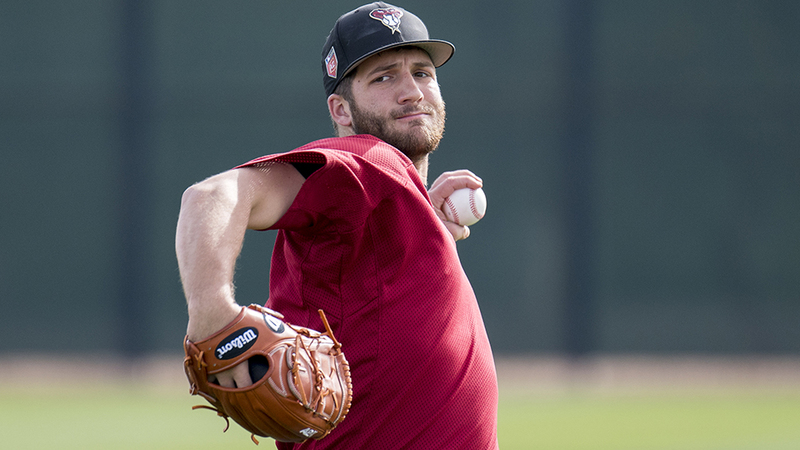 The way that Colin Poche began the Southern League season, though, it was pretty obvious that the left-handed reliever would be nearly impossible to pass up as one of the two players owed the Rays. After striking out 23 over 11 scoreless innings for Arizona's Jackson Generals, Poche faced his old team twice for the Montgomery Biscuits during a five-game series that immediately followed his switch of organizations. Poche struck out eight former teammates in four shutout innings and ended his dominant stay in Double-A with a third scoreless outing against the Biloxi Shuckers before being promoted by Tampa Bay to the Triple-A Durham Bulls on Friday. "It's been crazy," said Poche after arriving in Charlotte to join the Bulls for their International League series with the Knights. "Everything has happened really fast." As excited as Poche was to get the quick call to Triple-A by Tampa Bay, overmatched hitters in the Southern League were feeling the same way about not having to face the reliever anymore. Poche, a 14th-round choice by Arizona in the 2016 Draft, had a 0.38 WHIP in 12 total Double-A outings, fanning 32 while scattering two walks and four hits in 16 innings. He proceeded to maintain his spotless ERA with Durham, scattering a hit and walk with five strikeouts in his debut Friday night. If anyone deserved a promotion, it was Poche. Even if he had barely gotten to know his Montgomery teammates, one of which -- second baseman Nick Solak -- had gone from the Yankees to the Rays in February as part of the three-way deal that sent outfielder Steven Souza Jr. to Arizona and infielder Brandon Drury to New York. Being a part of the deal eventually wasn't a total surprise to the 24-year-old Poche. "I'd seen a lot of scouts around looking at me and I thought that something might be up," he said. "But I wasn't told anything until it happened." May 1 was a day off in the Southern League, and a series in Jackson between the Generals and Montgomery began the next day. "I parked in my same spot at the stadium and just headed to the other clubhouse. It was weird," Poche said. By the second game of the series, the Texas native was pitching against his old team. "It was like an intra-squad game in Spring Training," he said. "I'm sure the hitters knew what was coming." The results, though, were just the same as if they didn't. Poche's fastball doesn't light up radar guns, usually staying around 92-93 mph. But it appears much faster to hitters because of the way he hides the ball on his load and then aggressively takes a long stride to the plate. "I've always thrown that way," he said. "Even when I was young and throwing slow, I was getting it by people." Poche pitched two years at the University of Arkansas after declining to sign with the Baltimore Orioles as a fifth-round pick in 2012, then spent his junior season at Dallas Baptist University following Tommy John surgery. A starter in college, Poche has dominated Minor League hitters out of the bullpen. Over 31 appearances at two Class A levels a year ago, Poche posted a 1.25 ERA and had 81 strikeouts over 50 1/3 innings. Then he followed that up with solid work in the Arizona Fall League, fanning 21 in 16 1/3 innings. "My fastball is my best pitch and I throw it a lot," Poche said. "It probably plays better in short stints out of the bullpen." The D-backs agreed and so do the Rays. Now Triple-A hitters will have to try to solve the deceptive lefty. Guy Curtright is a contributor to MiLB.com. This story was not subject to the approval of the National Association of Professional Baseball Leagues or its clubs.